Pray for our Mission – Ongoing faith-filled prayer for God’s provision and will to be accomplished through Habitat in our community. 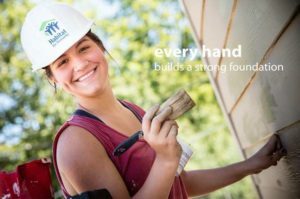 Please send us a message through the Contact Tab to encourage us with your commitment to pray for the work of Habitat for Humanity in Okaloosa County. Make a Monthly Pledge – Ongoing regular support is key to successful planning. Send a message through the Contact Tab with the pledge amount; we will contact you to give instructions regarding making secure payments either online or via mail. 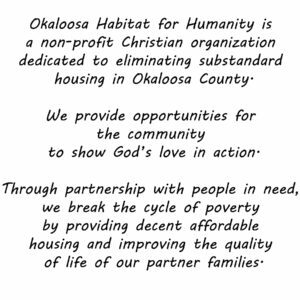 Pastors: To Celebrate 28 years of Habitat In Okaloosa County, would you consider taking a special offering for Habitat sometime in March? Send a message through the Contact Tab if interested in utilizing Habitat donation envelopes. Make a One Time Gift – Visit our Donation Tab. Provide Lunches for Construction Crews – We provide lunches for our Saturday construction volunteers and for special work days. Lunch may be provided for one or multiple work days depending on what works best for you. Send a message through our Contact Tab to say ” Interested in Providing Lunch”; we will contact you to firm up the details. Volunteer for Construction or ReStore – Visit our Volunteer Tab. Because of your support there are 61 Habitat Families experiencing stability in our community. Your continued support Can Make a Difference in the lives of many more.